Buying in bulk doesn't have to mean spending exorbitant funds, and inexpensive prices don't necessarily point to cheap quality. Thanks to Pobjeda Technology, you can stock up on reliable .380 Auto range ammo without blasting a hole in your bank statement. Located in Bosnia, Pobjeda Technology is an ammunition company with decades of production experience. They are well known in Eastern Europe for their ventures into conventional ammo, less-than-lethal rounds, and blank-fire cartridges. They regularly export to Russia, Austria, and Poland; as well as many other countries. They maintain the same precision and high quality standards as much larger plants by using the reputable German-made Fritz Werner milling machinery. 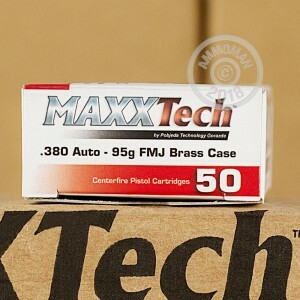 This package, labeled as Pobjeda's "MAXXTech" line, includes 1000 rounds of .380 Auto with full metal jacket bullets. The rounds use reloadable brass casings and non-corrosive boxer primers. The 95 grain bullet will exit the muzzle of a 4 inch barrel at 918 feet per second. 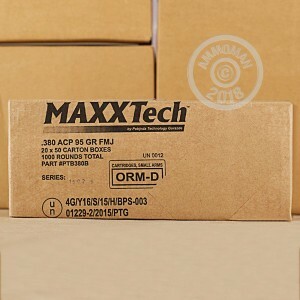 If you're stocking up on range ammo for practice with your Ruger LCP, Glock 42, Smith & Wesson Bodyguard, or any other .380 pocket pistol then this is one of best deals available.